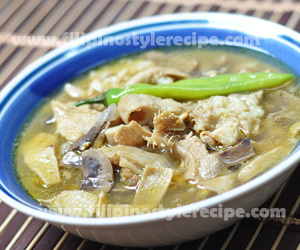 Filipino Style Recipe: Papaitan or Pinapaitan is another popular Filipino soup dish that was originate from Ilocos region. It is consist of ox or goat tripes and innards cooked in bile and sampalok or calamansi juice that gives the soup of sourness and bitterness taste. 1. In a pot, Boil 4 cups water with 1 tablespoon salt. 2. Add ox innards and simmer for 30-50 minutes or until tender. 3. Drain and let it cool. Slice into small pieces then set aside. 2. add ox innards and continue sauteing for 3 minutes. 3. Pour 4 cups of water and simmer for 10-15 minutes. Add water if needed. 4. Pour bile and simmer for another 5 minutes. 5. Add green chili, calamansi juice, salt and pepper. Simmer for 3 minutes. 6. Adjust seasoning according to taste. Remove from heat then serve hot.